Our business activities are dominated by operational continuity. 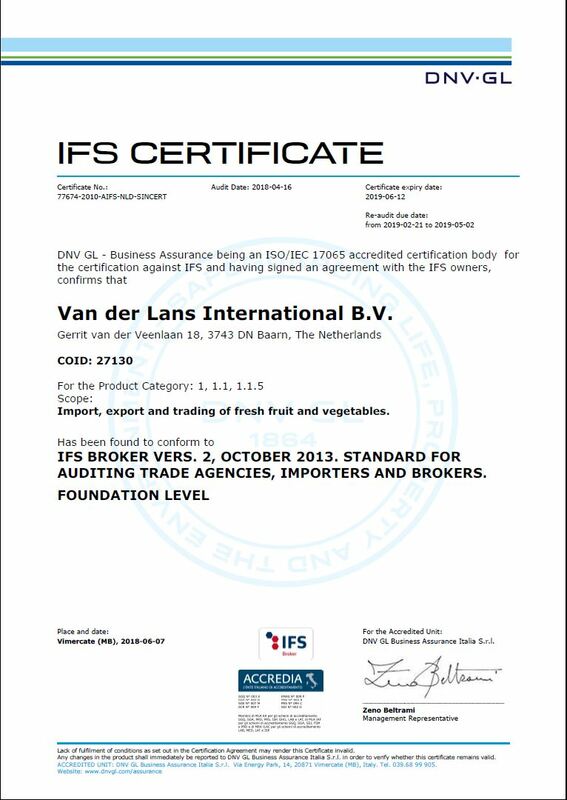 Continuity in importing and delivering the finest quality fruit and vegetables. Our deliveries are punctual and reliable. Always exactly as agreed and in the right quantities and packaging. Our strong and independent financial position makes us a reliable partner for both our customers and our growers. To guarantee our product quality and organization, we are IFS certified. In addition, as allied partners, our growers are GlobalGap and BRC certified and are able to supply a social certification if this is required. Our general terms of delivery are available digitized. Click on the link below. The document will then be downloaded to your computer and opened in Acrobat Reader.